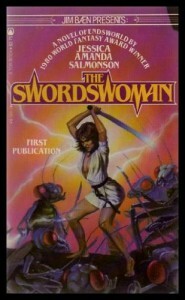 I finished reading my battered Science Fiction Book Club edition of The Swordswoman for the umpteenth time last night and thought to put down some thoughts on why this book garners four stars. I first read the book as a teen, during a time when I was discovering a number of female authors and strong female characters (including C.J. Cherryh and Phyllis Ann Karr to name two) and I was taken with Salmonson's character Erin of Thar. The story concerns Erin Wyler, a young Earth woman who's dreamt of living a hero's life in another world. She's a loner, going in and out of institutions her whole life and never finding any amount of happiness except in studying martial arts. During a kendo match, she kills her opponent but his wounds reflect a metal blade, not the bamboo stick she was using. An obsessed paramedic discovers that both she and her opponent have had dreams about the same world, only from opposite points of view. Erin dreams of being the rebel who kills an evil tyrant; her opponent dreamed of being that tyrant. In that alternate world, however, Erin's alter-ego Merilia is the one killed so forces present in both worlds conspire to bring Erin to Endsworld to fulfill Merilia's destiny. Salmonson bases the alternate reality, Endsworld, on Asian influences. The world is ruled by a warrior elite whose ranks are differentiated by the number of swords they carry. One-swords are cannon fodder, minimal training with a short sword - the i. Two-swords are better trained, carrying both i and mai, and run the gamut from merely competent to expert. Three-swords carry the oude - a great sword - and are wuxia style masters. The story follows Erin as she arrives in Endsworld and her development from unwilling pawn to someone able to replace Merilia. I've always found the story itself fast paced and interesting, and Salmonson puts enough "twist" into the usual hero epic to make it worth reading. But I also like the fact that the ending is not a "happily ever after" cop out or that we'll ever know the eventual fate of Erin. The ending screams out for a sequel (and I'd be happy to read it) but (as far as I know) Salmonson has never followed up with one.